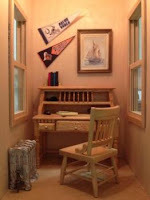 "The Nook" is a one-day workshop during which we will paint and decorate a lamp style roombox. We will finish the exterior of this fully assembled lamp base, which includes a four-way light switch (offering a wonderful nightlight interior), with a paint and stucco treatment. We will also stain the door and windows. The magnetic front panel is removeable for ease of interior decorating with wallpaper and flooring as well as furniture placement (approximately 5" x 5-1/2" interior space). The door and two windows will be selected and purchased separately at the time of the workshop allowing you the opportunity to choose the style you prefer. The first model shown has the Palladian door and windows, but it is also available with Victorian or Traditional components. The all-day workshop is October 27, 2012 beginning at 10:30 am. Remember, registration with your $85 payment is due by October 25, 2012. The lamp shade, door, and windows are NOT included in the base cost. You'll have the opportunity to select your favorite at the time of the workshop.